With a revolutionary approach to purchase and delivery, Simba Sleep are paving the way to the easiest night’s sleep there is. With next working day delivery and a foolproof packaging approach, the road from buying to snoozing has never been smoother. How do I use my Simba Sleep Discount Code? Where do Simba Sleeps's mattresses fall on the 'firm/medium/hard' scale? Will I have to pay for Simba Sleep's 100-night trial if I'm not happy? Simba Sleep will courier the mattress themselves, and donate it to charity or recycle it. How Do I clean my Simba Sleep mattress? Use a damp cloth or a light fabric with cleaning products and use small circular motions to clean. Never machine-wash the cover. Simba deliver with UPS, who offer a tracking feature with delivery. Cut-off for next-day delivery is 5pm Monday-Friday. For a list of postcodes that are not included in the next-day delivery click here. Simba recommend waiting 30 days to adapt to your new mattress before returning. If you are still dissatisfied, Simba will arrange a free pickup and refund anytime in the first 100 days. You will still be refunded if you have removed the coverings. Having trouble sleeping? Wake up with back pains? Simba Sleep have received rave reviews for their uber-comfy mattresses, delivered to your doorstep the next working day. What’s more, a good’s night sleep doesn’t have to cost an arm and a leg when you use your Simba discount code. No more stiff necks and sagging bedspreads. Simba Sleep have a scientifically proven approach to providing your body with the top support for a healthy and comfortable night’s sleep. 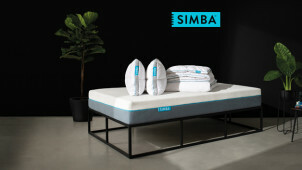 Simba Sleep have teamed up with the Sleep To Live institute, who have based their research on over 10 million people, to create the most scientifically ergonomic mattress. With a patented design, Simba Sleep use an innovative design boasting 2,500 conical springs to provide flexible support for all body types and to keep stability for two different people. Now you can sleep easy when your bedmate sneaks off for a midnight snack! If anyone respects the value of a comfortable night’s rest it’s Sleep Simba. With their 100-day sleep trial you can ensure that your mattress is suiting your needs perfectly. You can order now, receive your mattress for less with a Simba Sleep voucher, and try it out for 100 nights of peaceful sleep. And if you aren’t satisfied you can wing it back free of charge to be donated to a local charity or responsibly recycled.